First of all, I must reiterate that this ornate conceit (in the original sense of that word) was only included as a jeu d'esprit, a sudden impulse to splash such an elegant trifle upon the electronic surface of the OrnaVerum website as an extravagantly decorative visual feature. Quite apart from the regrettably misspelt Motto, I had no idea as to whether the design was (at least in large part) heraldically genuine, and if so, whether it did definitely pertain to the Waddell family, and if so, to the Balquhatstone branch of the family, and if so, did it only descend via the first-born son (or otherwise, maybe, Scotland being the enlightened place that it is, via the eldest daughter). In all probability, it would have passed via Great Uncle Peter down to his sons and grandsons now domiciled in Australia. One thing that I did take for granted was that this coat of arms was granted by the Scottish monarch to a loyal subject (and his family in perpetuity), who was already resident in Scotland. It never occurred to me that a newly-arrived immigrant way back in the mediaeval or premediaeval period might actually have brought it with him from elsewhere in the British Isles, such as England, or even from abroad – such as Normandy or Flanders. And I had absolutely no idea that each of the 'design-features' comprised in a typical coat of arms had anything other than purely artistic significance, and that these features taken in their entirety could be examined and deconstructed, rather like cryptic clues in a crossword, to reveal the personal and dynastic details of its bearer. At about the beginning of this year (2013) I was contacted firstly by Freda Bingley (née Waddell) and then slightly later by Gavin Main Waddell1 and then, most recently, by Anne Burgess. For the benefit of the uninitiated such as I was myself, these three individuals are probably the foremost exponents of the history, genealogy and heraldry of the Waddells in Ireland and/or Scotland. Researchers at the cutting-edge of any discipline quite frequently disagree between one another (just look at the current furore about who invented the Higgs boson) and so it is not to be expected that Freda, Gavin and Anne always concur with one another in every respect. Whatever tiny iota of heraldic knowledge I may now possess is gained entirely from them (plus a little bit of practice with the Kaulback arms – see the Arma Virumque Cano section). Although heraldry came later to have strong military associations, it may have developed much earlier from the personal seals of the court officials of Charlemagne whose administrative organisation used devices that later became familiar as heraldic symbols – the fleur-de-lis, the lion and the eagle. These devices were seminally defined as "hereditary marks of honour, regularly composed of certain tinctures and figures, granted or authorised by sovereigns, for distinguishing, differencing, and illustrating persons, families and communities". And further "These marks of honour being represented upon shields, surcoats, banners, pennons, and other military ensigns [were] called arms, coats of arms, and armorial ensigns". Only those who were allowed to take their own weapons into battle were deemed able to "bear arms". So let us start with the basics. Reference links are in every case to the very readable accounts in Wikipedia. The arms of an individual or family, heraldically termed the achievement or blazon, comprise the following standard features – already itemised for the Kaulback arms – and which we can now reprise in slightly greater generality – hopefully avoiding any embarrassing ultracrepidation on my part. The shield, called an escutcheon (from Latin scutum = shield). The symbols which decorate the shield [are] called charges and the area thereby embellished [is] called the field or ground. The principal charges [are] called ordinaries, of which there are nine. The lesser charges, generally smaller devices or geometric figures, [are] called subordinaries. For example, subordinary shields (as in the Kaulback arms) are also called escutcheons – or an inescutcheon if single in number. There is probably an uncountable number of subordinaries in the heraldic canon; of particular interest to us will be the buckle, the pheon (arrow head), and the crescent. At least one helmet (occasionally two, rarely three or more) called a helm or casque, surmounting the escutcheon. A loop of twisted fabric called a wreath or torse, surmounting the helm. A real or mythological heraldic beast or head surmounting the wreath, called a crest. A swirling representation of a knight's surcoat torn or hacked in battle, called a mantling – more closely resembling stylised foliage, in fact. An elaborately curling scroll or ribbon, called an escrol, beneath the escutcheon, bearing a motto usually in Norman French or mediaeval Latin. The motto derived from the battle-cry; we Waddells would charge into the fray bellowing "Orna Verum" at maximum decibels and the foe would simply turn and flee. However, the Scottish practice is to locate the motto above the crest rather than below the shield, that position being replaced by a scroll bearing the family name. Supporters – usually heraldic beasts placed on either side of the shield, as in the case of the royal lion and unicorn. The seven principal colours, or tinctures, used are standardised as or = gold / yellow, argent = silver / white, (jointly known as metals), azure = blue, gules = red, purpure = purple, sable = black and vert (sinople) = green. A natural colour is known as proper. Chequy, as one might guess, implies a chequerboard alternation of colours, such as "chequy or et gules" to describe the saltire in the Waddell arms. "Azure, a saltire chequy Or and Gules between four buckles Argent. Above the Shield is placed an Helm affrontée, with a Mantling Azure doubled Or, and on a Wreath is set for Crest a lion's head erased Gules, and in an Escrol over the same this Motto 'ORNA VERUM', and in an Escrol below this shield the Family Name 'WADDELL OF BALQUHATSTONE' ". But what is this new word "erased" doing, anyway? Erased in fact signifies that the head is depicted as though torn forcibly from the rest of the body. The other possibility is couped, in which the head is depicted as though cut cleanly from the rest of the body. And though the lion is facing to our left, could he face the other way, to our right, perhaps? Yes he could. The default orientation dexter is to our left (his right), and the opposite orientation sinister, to our right (his left), must be specified if required. The intermediate orientation affrontée is a possibility reserved for humans or quasi-humans – as in the Waddell helm, in fact. The Kaulback helm is dexter, probably by default. And there are many others: Sejant (erect), Couchant (lying down), Courant (running), Dormant (sleeping), Salient (springing) and Statant (standing). But there we must call a halt – the subject of heraldry could easily become as fascinating and endlessly absorbing as family history, and we would need several lifetimes to master either of them. This was invented as a furious (though belated) response to the replacement of Cartesian vortices by Newtonian gravitation – surely this at least would be something that perfidious Albion could never comprehend, let alone do away with. Well, we have picked up on it, and actually it doesn't seem entirely silly. In fact, I had rather understood that a great deal of mediaeval family history, even if the written documentary evidence had been lost or destroyed, could be recreated by examining what had progressively occurred to the family arms en route. And I had believed that the contentious issue of exactly how the Waddell surname had evolved could be likewise elucidated in this way. That's why this section is called the Heraldic Footprint. And why I've spent a great deal of time, and burned-out several million neurones, in mastering the barest rudiments of heraldic practice as outlined above. It may yet turn out to be a rewarding investment, but the family history that it was meant to illumine will now be presented in the French Connection. 1: The doyen of researchers in this field, Gavin Main Waddell is now (May 2013) finalising publication of his magnum opus A History Of The Waddells Of Scotland. I'm very fortunate to have had preview of his key chapter on Waddell Arms. He in turn has had preview of this material and has in some respects found it wanting in precision. I'm happy to put on record the following clarifications and disclaimers. Though they may in the past have been used by the Balquhatstone Waddell family, these arms have never been registered with the Lyon King of Arms. 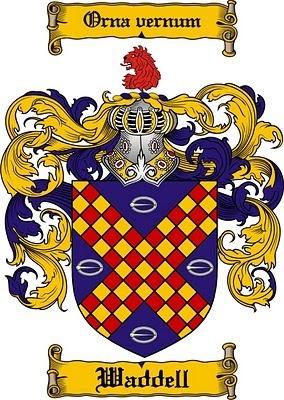 They should in any case not be referred to as 'the Waddell arms' as they apply only to the senior member of the family, descending by primogeniture. I have absolutely no personal inclination towards them, let alone personal claim upon them, having merely come across them on an internet gallimaufry of such items and displayed them on this website simply as a curiosity. I certainly wouldn't encourage anybody else to try to appropriate them for personal use without getting them validated and registered with the abovementioned authority – a lengthy and expensive business! 2: An appalling pun, with apologies to Herself (M E M Donaldson). 3: And another one, with apologies to the autrix of the Harry Potter stories. 4: This 'worked example' is reverse-engineered mutatis mutandis from Gavin Main Waddell's personal Coat of Arms, registered with the Lyon King of Arms.